Car Cigarette Lighter 12V Plug Socket with Eyelet Terminal. 10FT Length. 15A Heavy Duty Premuim Quality 16AWG Copper Wire. 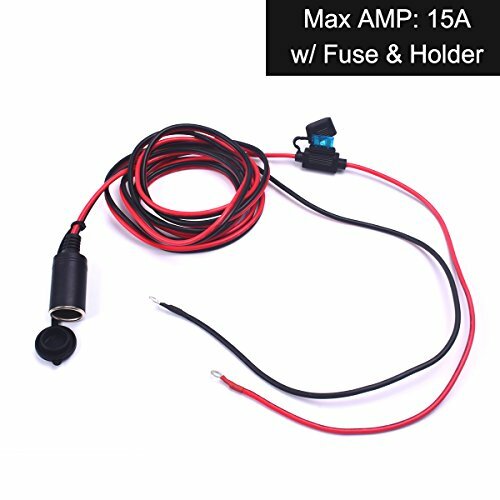 15A Fuse and Holder included. Universal to any car devices with cigarette lighter plug. Red cable to car battery's positive pole, black cable to car battery's negative pole/GND, simple and easy to use. 1) Ring terminal directly link to car battery power and extends your 12/24-volt power source . 3) Car Cigarette Lighter 12V Plug Socket with Eyelet Terminal. 4) Durable electric wires in protective plastic shell. 5) It is designed to extend your 12-volt 24-volt power source to cooking appliances, coolers, heated blankets, lights, cell phone, tablet, or car electrical appliances such as car cleaners, car pump, car charger, car inverter, etc. 6) Anti-break design in the connection spot.